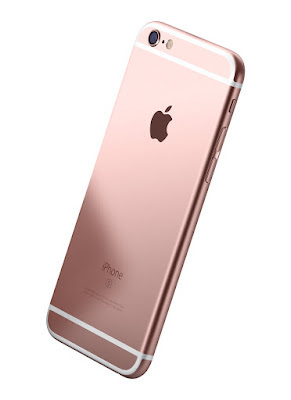 Rose gold - ooooh so pretty! The day my old landlord told me I had to move out by the end of December (I didn't move out until the end of February but that's another story) I dropped my old iPhone on the sidewalk and I got a nasty ugly crack on the screen with a little piece chipped out of the corner. It was embarrassing to be seen with it. I know, first world problems, right. But anyway I could finally afford a new phone and it's one of these whopping big iPhones with the amaaaazing video capabilities. Meanwhile, as I was moving, the Jawbone Up2 activity tracker band my daughter gave me for Christmas fell off my wrist and was gone forever. So I bought another wrist band and had it for two weeks until that one fell off and was gone forever. So I was not about to buy another one, it was starting to look like the ease with which the Jawbone band fell off my wrist wasn't the result of a poor design but rather Jawbone's businesss model. So I complained about it bitterly to Jawbone so they sent me a new one and two weeks later, here it is. I mean it was awful - for weeks I had no ideas how many steps I was taking every day! I feel much better now.